Spring is just starting to make an appearance here in Kent in England. 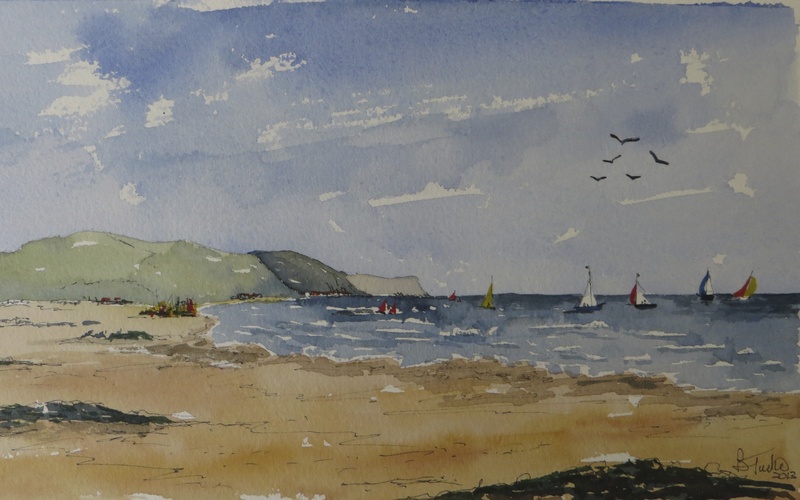 As regular readers of this blog will know I like to paint watercolours from my photos of seascapes and so I thought a post bringing a few of my Seascapes together might help me look forward to the warmer and sunnier days to come. Going through my paintings archive I discovered that there are many such paintings, too many to put here so I have just chosen some that I painted over the past few years. 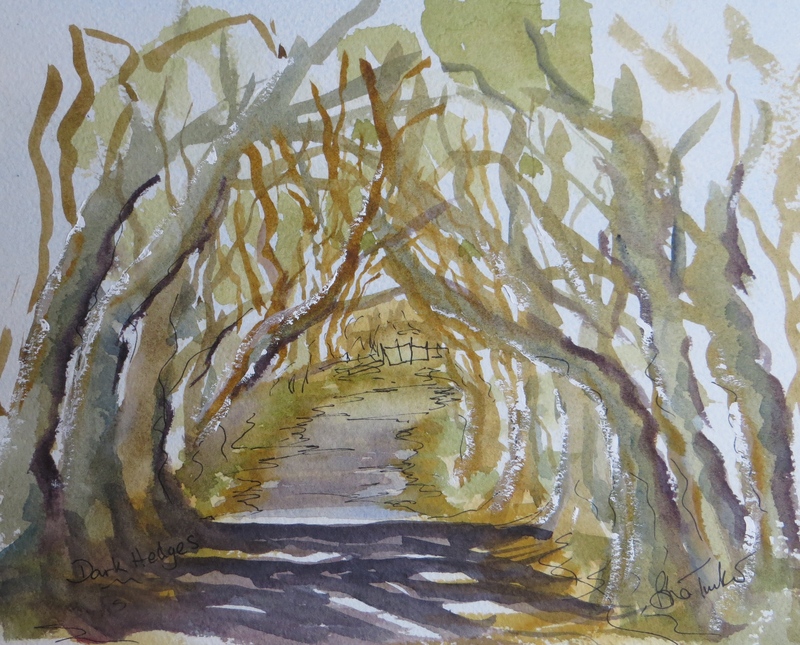 Most of the painting are 14 inches by 10 and painted on Arches 300gsm watercolour paper. Mostly they are places I am familiar with but one or two fit into the category of place I would like to visit as they were gifts or commissions. The beach at Ballycastle in Northern Ireland. The Golf Course and Beach at Pine Cliffs in the Algarve in Portugal. Enhance your Family History Project with Paintings!! The Black Arch on the Causeway Coastal Route. By way of a diversion I thought I might introduce you to an idea I had some years ago which can add some extra interest to the documenting of your Family History project. Researching the historical background of your family is fascinating but can produce a lot of data and alas that data, whilst interesting to the researcher, does not make interesting reading for the younger members of your family who may (??) one day, show some interest in all that research. I guess it is not till we all advance in years that the history of our families becomes a bit more interesting anyway! Just leaving the succeeding generations all the data is unlikely to be a successful strategy so producing some form of booklet or document is most likely to be a more useful hand me down for the future. Paper is not much in fashion these days but a paper book or document, maybe also produced as an eBook as well, is still very likely to stand the test of time. Even for bloggers like us paper is a good solution for long term storage of all that hard work documenting the past few hundred years. The heart of your project will probably be the Family Tree but adding narrative to each of the families covered by your research will add some insight of the people in the Tree and their way of life. I decided that to bring the project even more to life I would include as many photos of the people as I could find but that won’t take you back before the mid or late 1800’s. So to illustrate the histories of the families I decided to add some watercolours of the places they came from, sometimes as they might have been at the time, or just places that they liked to visit. Paintings of the Churches they were married in seemed an obvious choice and where possible the houses they once lived in. Even if these have long been demolished you can sometimes find data to reconstruct the scene, at least to give some context to the narrative. If your narrative can give some insight as to how they lived in years gone by this can be very interesting too. You will be pleased to know I am not going to bore you with my research data, but here are a few paintings that I have used to illustrate the Family History Book of the 6 major families that it covers. First of all a couple of Churches painted as near as possible to the way they looked at the time. An earlier generation of my family were married in Minster Abbey on the Isle of Sheppey in Kent during the exceptionally cold winter of 1911. This was the year I believe that Niagara Falls froze over too! In the late 19th century some of my ancestors lived in the middle house below West Malling in Kent. Here I have tried to reconstruct the scene in 1891. He was the local Weights and Measures Inspector, an inserting job, which invloved testing the beer in the local breweries almost every day! The earliest record that I have so far managed to find is of a wedding in Lenham Church in 1628. I don’t think they had Linseed growing in the fields then but my painting tries to show it anyway! Lastly some branches of my family and my wife’s family hail from Northern Ireland. So here is the Church of St Anne in Belfast where a marriage took place in 1869. The Church was demolished in the 1890’s and the fine (and still standing) St Anne’s Cathedral was built on the site. 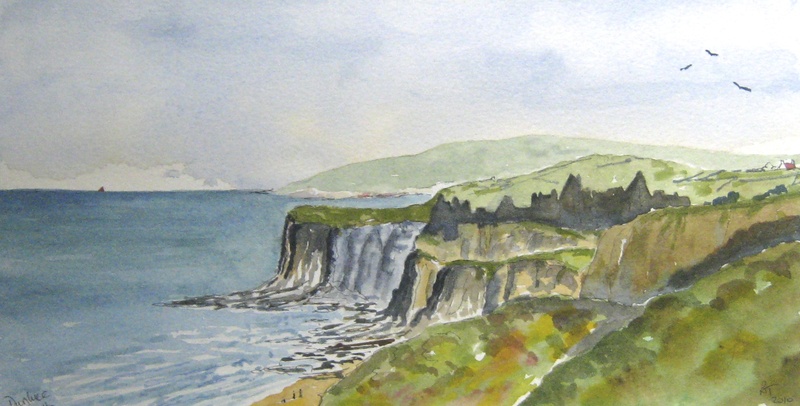 And lastly we had, and have, close associations with the whole beautiful Antrim Coast in Northern Ireland. This spectacular coastal route has featured in a number of my previous posts. 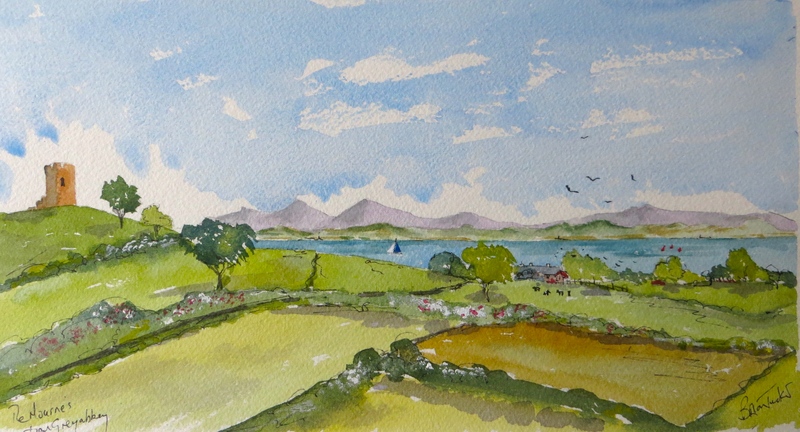 So here is a watercolour of Carrickfergus, the beginning of the Causeway Coastal route and a town with many associations with our families. I hope you have enjoyed this diversion. Back to more recent travels soon! When you are on a roll! I had such nice comments about my last post, “A New Venture” and the guide book to the Cote d’Azur that I thought that I should follow this up quickly with the second book in the series. 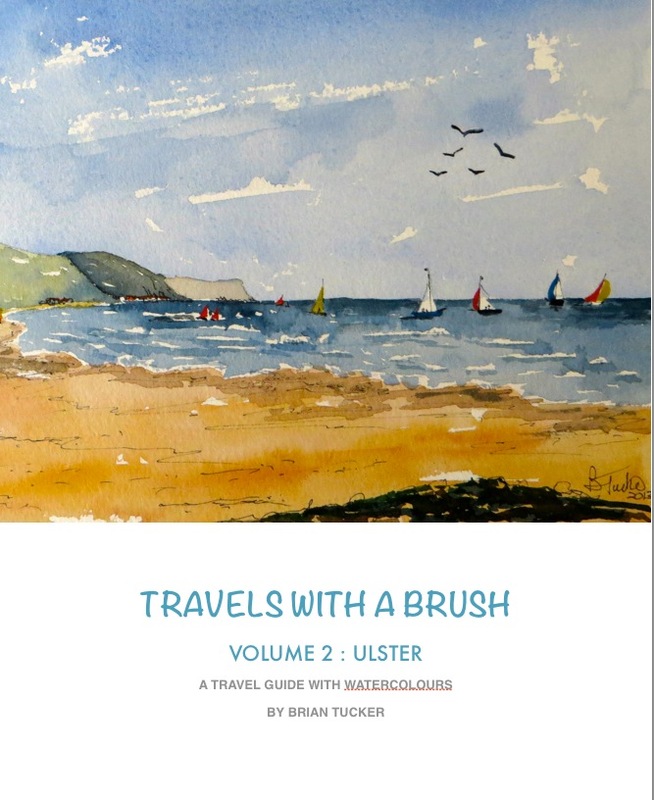 This new book is about Ulster, the most northerly Province of Ireland and becomes number 2 in the series “Travels with a Brush”. I hope you will like this one too. 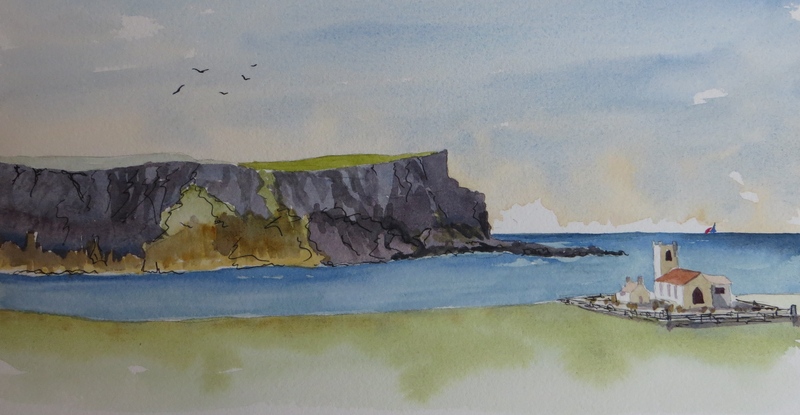 It is dedicated to my Mother in Law, Sadie, who died last year and who loved this beautiful part of Ireland, especially the Antrim Coast which is the first Chapter of the book. I am waiting for the book to appear on the Apple iBook store but for non iPad users there is a PDF version at the top of this post which can be viewed and downloaded. Once again all comments would be most welcome as that will help me with updates and subsequent volumes in the series. I hope you enjoy looking through it and if you haven’t been to this part of the world, put it into your future itineraries! For family reasons we have been spending time in Northern Ireland recently. Sadly this time has seen the recent death of my Mother in Law, Sadie, who was a lovely lady of 85 years. 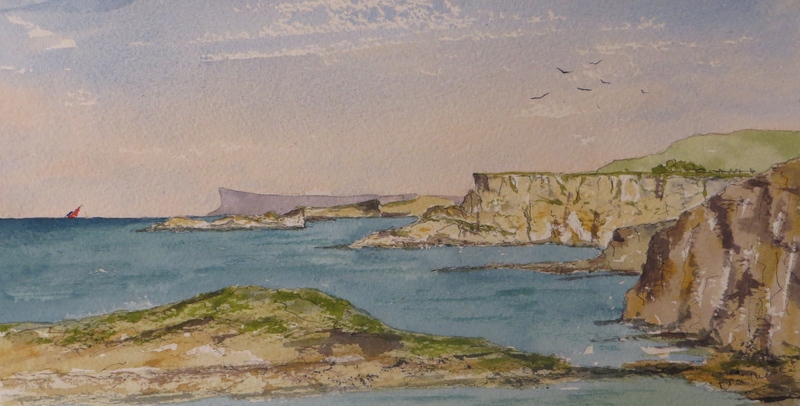 Sadie always had great love for the Antrim Coast as it had very special memories for her, especially the area around Drains Bay and The Black Arch. We will all miss her a great deal, and so this blog is dedicated to Sadie, a very special lady indeed. These places are special to us too and I hope this blog will encourage you to visit, or if you know the area to enjoy once again the wonderful scenery that is found there. If you start in Belfast the Causeway Coastal route is well signposted and over a day, or two, if you have the time this route takes you along some of Northern Ireland’s fine scenery and one or the World’s great coastal drives. 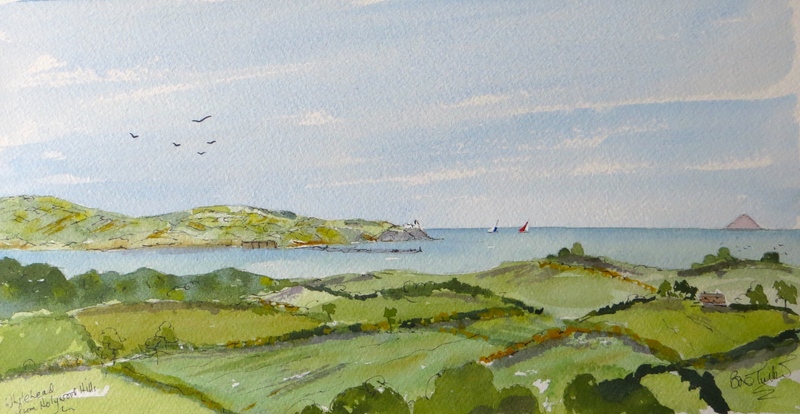 This series of paintings, some of which go back a few years picks out just few spots on the Coastal journey. As a starting point Belfast is a fine city but these days one of it’s not to be missed highlights is the new Titanic centre, located in the area once occupied by the huge Harland and Wolff shipyard. A few hours spent there will be rewarding with its visions of Belfast of old and the history of the ill fated Titanic. On leaving Belfast via the Causeway Coastal Route the road hugs Belfast Lough and the first major town you will arrive at is Carrickfergus. Carrickfergus has one of the best preserved Norman castles in the British Isles. It is located next to the harbour. Built by Robert De Courcy in the 12th century it dominates the town. After leaving Carrickfergus the roads turns inland but soon arrives near Whitehead. Turn off into Whithead and enjoy it painted seafront houses and hotels. At the northern end of the town there is good coastal path that leads towards Whitehead lighthouse located on the cliff top. after leaving Whitehead the roads lads towards Larne,today cross channel port to Scotland. ferries have been going from here for many years. Follow the Causeway Coastal route signs and the road soon rejoins the sea, and before arriving in Drains Bay you pass through the natural archway across the road known as The Black Arch. Just one of many aptly named landmarks on the coast. From Drains Bay the road hugs the coast and eventually brings you into Ballygally. The old castle is nowadays a good hotel and if you park at it and look back at the hill that you have just passed you will see the distinctive features of face profile that the shape of the hill makes. (Zoom into the painting below to see it). This area of the coast has been inhabited for Neolithic times apparently. You are certainly treading in the steps of history! From Ballygally the road continues to be close to the sea, passing through very nice small towns of Carnlough, Glenarm, Glenarriff and on to Cushendall. If time permits turn off at Glenarriff and turn into the beautiful glacial valley you will see there. Back at the coast you will see that sailing around this whole coast is favourite pastime, almost anywhere you will find yachts off the shore. Ballycastle has great beach and golf course too. From Ballycastle the road rises over the hills, but divert off it to Ballintoy and do stop at the headland at Whitepark Bay where the view is really spectacular. If you feel brave stop to at the Carrick a Rede rope bridge, and there walk across to and island above the pounding sea! From there you will shortly arrive at the Giants Causeway. The new visitor centre is well organised and you can even get a bus to the actual stone formations by the sea. These hexagonal rocks, formed millions of years ago are quite extraordinary. It is rarely calm there so the pounding sea adds to the drama of the place. Here are two paintings of the Causeway. The causeway coastal route continue further on to Portrush and beyond, but before setting off further do visit the nice little town of Bushmills. Here are good restaurants and cafes and most importantly the famous Bushmills Distillery. This, the earliest Distillery in the British Isles to be licenced is the home of Bushmills Irish Whiskey. It has a different taste and aroma to Scottish whisky so a tour of the Distillery is a must and a sample at the end of the tour will encourage you to take a bottle or two home! Before heading to Portrush turn off to Portballintrae. A small seaside resort with a nice harbour. After leaving Portballintrae the road will take you past Dunluce Castle. This ruined castle is perched on the cliff edge and is interesing to explore, but it can be seen well from parking area just past the castle on the Causeway Route, that view is shown below. At Portrush you will find golden sandy beaches, dunes and a very famous golf course, Royal Portrush, a terrific challenge for any golfer. This seaside resort used to be the summer destination of Belfast folk, although much quieter now it is still a holiday destination. Nearby is Portstewart where you can drive on to the beach and not far inland is the bustling town of Coleraine . There you can cruise on the River Bann which flows from Lough Neagh, the largest inland lake in the British Isles. This blog is only a little snapshot of this great coastal drive. If, like us, you are attracted to areas where mountains meet the sea you will really enjoy travelling there. For me there is the benefit of scenes to paint too! 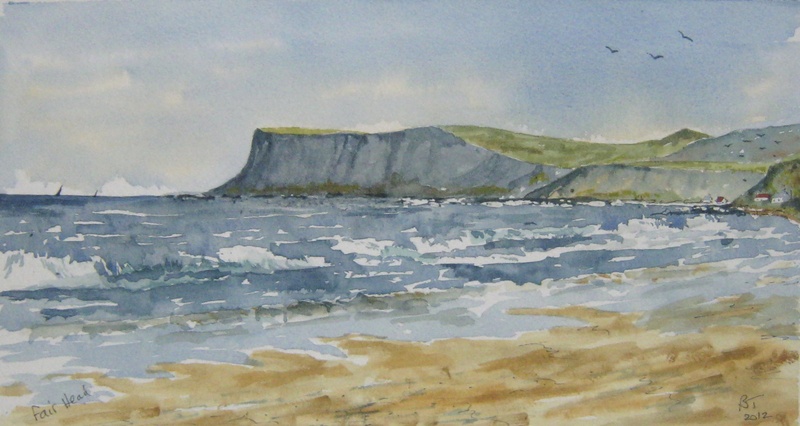 Posted in Antrim Coast, Landscape, Paintings from our travels, Travel, USA, Watercolours.